Central London Hotel Pick-ups to Port of Dover cruise ship terminals. For those of you that are arriving into London a few days earlier than your cruise and travelling to Port of Dover on the day of your cruise. I'm sure you are looking forward to enjoying this vibrant and ever changing City called London with it's fantastic theatres and restaurants. Then why not book your transportation with a limo chauffeur driver. The best way to arrange your London transfers from a London hotel to Dover cruise ship terminals is to book online before you travel as this will avoid overpaying for a taxi transfer on the day of your journey to Port of Dover. We will pick you up or drop off to any London Hotel or private address. Please wait in the hotel lobby for collection , your driver will come in find you at the arranged time. Heathrow Hotel transfers to Dover cruise port are also available if you have pre-booked this beforehand. Please wait in the hotel lobby for collection at arranged time, your chauffeur driver will come in and find you. For passengers arriving on the morning of their cruise and wish to book a pick-up from the airport terminal to Dover cruise ship terminal this can also be pre-booked with us. Your driver will be waiting for you at the information point in the arrivals lounge with your name on a board. Please note that the driver will wait one hour and 30 mins after your flight lands so please let us know if you think it will take longer to clear passport control and customs. 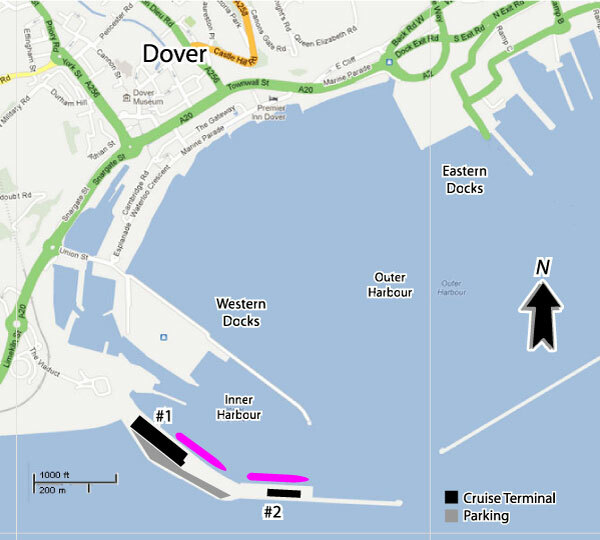 Journey times based on normal traffic conditions for transfers to Dover Western Docks where both cruise ship terminals are located.